I'm Nurfarahin, a 21 year old girl from Malaysia studying for a Bachelor of Nursing at university. For Malays, we wear our traditional costume (baju kurung, baju kebaya) which is suitable for wearing with hijab. I love to wear it with a shawl, heels and a small hand bag if going to any special occasions. When I'm going to class I usually wear simple, comfortable clothes. I'll try to add bangles or bracelets to make the look more funky and trendy. Sometimes, I like to look a little more retro, so I'll wear a blouse or t-shirt with a polka dot shawl and white glasses. Even though I love orange, I try not wear only that colour. I'll try to mix it with other colours so that it won't look too bright! For me, you don't have to be another person or try to be someone else. You have to be confident with yourself, and up-to-date with the latest fashion nowadays, as long as it will not change your faith in Islam. I hope that I can be an inspiration for all Muslimahs inshallah. Be brave when trying new styles; don't be afraid to use bright colours like orange and yellow, just combine them with other complimentary colours! I love that so many of your readers are from Malaysia! They are so cute! Masha'Allah these are some great ways to wear floral patterns. I like the long floral tunic in the upper right picture along with the floral abaya next to it. SAlam. You are so simple but very cute stye. U look confident of what u r wearing. That is the best! The Malaysian sister's have so much style, mashallah! lol. They are so pretty! 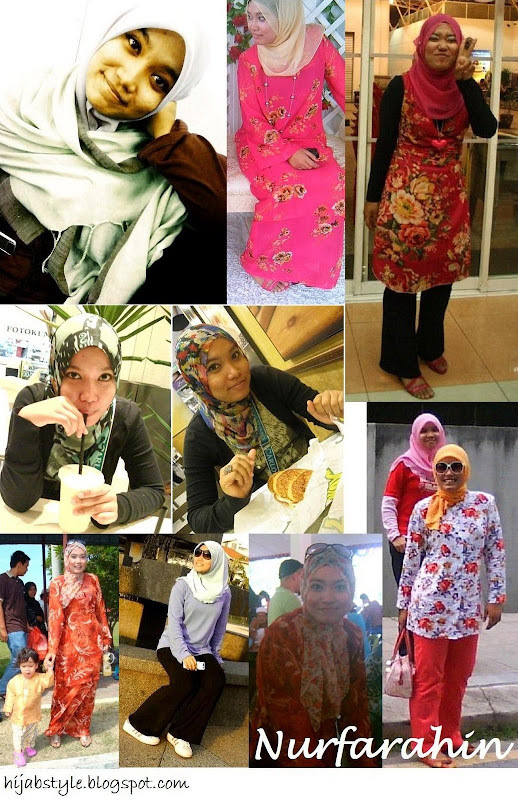 The pink "floral abaya" that you mention is actualy "baju kurung", Malaysia's national dress. It is a two piece outfit which consists of a long tunic-like top and long skirt. But there are certain features of the tunic and skirt that are specific to the "baju kurung". Even our school uniforms are in this style. My son recently was married to a wonderful Muslimah Malaysian young woman..their wedding pix show abayas, hijabs, etc in every color of the rainbow..so beautiful--like a lovely garden of flowers. I love this sister's style..so happy and uplifting to see all the color!